Next week, Makigami Koichi will participate in the Japan tour of Mori Ikue's "Kibyoshi" performance. It's a mixed media presentation based on Kibyoshi, a genre of Japanese picture book produced from 1775 to the early 18th century (wikipedia). 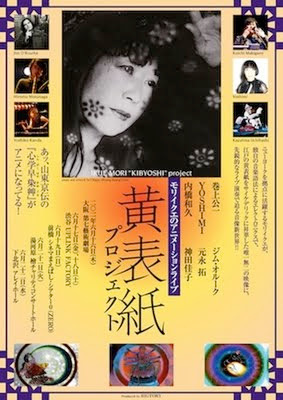 About 20 years ago, John Zorn gave her a book regarding Kibyoshi and she was soon fascinated with it. She vaguely envisioned for making a piece of work about it some day. In 2000, she started making music and animation with computer. At first she used a Bali art for motif and gradually turned to her roots, Japanese Culture. "Kibyoshi" is the latest project she committed. 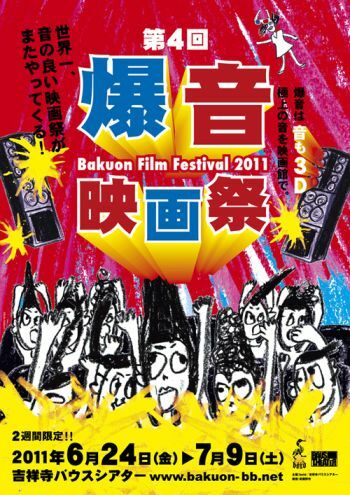 For "Kibyoshi" DVD, Mori created animation and laid the basic tracks for herself, then Makigami and Marc Nauseef overdubbed their parts. In this tour, Mori and Makigami are the regular member, and there are some musicians participated as guest so the personel is different for each date. The work and performance sound pretty interesting and it's surely a must-see. note: Jim O'Rourke (June 17) and Nakahara Masaya (June 18) are talk session participants and will not perform. Tomoda Shingo, the drummer of the Godzilla Legend concert in this June, also uploaded a set of clips from the Godzilla Legend performance in 2009. In some of the clips, the percussions are rather high in the mix. Maybe it has something to do with the fact that the event was originally planned for demonstrating Highleads, an electric drum kit which Tomoda designed. This month, Inoue Makoto will play a set of the repertoire that he loved most, the soundtrack from the early monster movies including Godzilla. It will be held as an attraction of the film festival called "Bakuon Film Festival." The performance itself will be a 40 minutes set and then a screening of the first Godzilla movie follows. Tomoda Shingo, the drummer, uploaded a video from a rehearsal for the concert. In it he played Highleads, a percussion kit which he designed. In 2009, Inoue did a small gig of his Godzilla music for the first time in over 20 years. It wasn't much publicized and many fans didn't even notice it. It's unsure he will do it again near future, so don't miss the opportunity. In the 2011 spring tour, Hikashu regularly played "Hi-Ai-Ai Island," an album cut from the 1988 "Ningen No Kao" album. The song was revived at their gig after a long absence. The arrangement was basically the same with the live version found in "Hikashu History," but this time it preceded a recitation of a poem by Mita Freeman. The poem is "Das Nasobēm" by Christen Morgenstern (wikipedia). Mita read it in original German. with its young in the tow. when it came first to light. The lyrics of the song, penned by Makigami, was based on a strange book called "Bau und Leben der Rhinogradentia" by Harald Stümpke (wikipedia). It's about Hana Aruki, an imaginary creature described in the book. "Hana Aruki" is the Japanese name, endowed by Hidaka Toshitaka, the renowned scientist and the translator of the book. 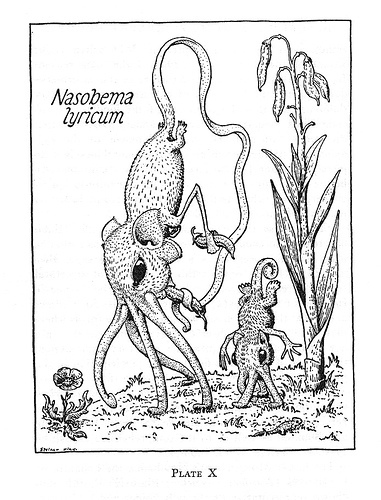 In original German, it's called Nasobēm. In English, it's called Rhinogradentia (wikipedia). Based on a book called "Bau und Leben der Rhinogradentia" by H. Stümpke, the song is about the descriptions and the impressions of Rhinogradentia, a creature walking by its nose. The island which completely browned out by an atomic bomb experiment and the study of Rhinogradentia make a mockery of the common sense vividly. Also pretty inspiring. A mysterious song. The Japanese edition of the book was published in 1987 and soon recognized as a minor classic by the connoiseurs. Makigami, an avid reader, was quite impressed with the book and wrote a song based on it. and wrote a poem about it. The island was full of noses. I wanna know your nice secrets. The poem Morgenstern wrote referred in the song is no other than "Das Nasobēm."